An escalation in fighting, increasing obstacles to aid delivery and lack of food and fuel, is compounding Yemen’s dire humanitarian crisis, the United Nations top relief official warned on Thursday, calling on all parties to the conflict to end the violence. Across Yemen, more than 22 million people are dependent on humanitarian assistance or protection, of whom around 8.4 million are severely food insecure and at risk of starvation. Amidst worsening suffering in the war-torn country, humanitarian agencies are also facing increasing restrictions on their work, said Mr. Lowcock. “Humanitarian staff are being detained and intimidated and visas are being delayed and denied. Programmes and missions are being interfered with in ways which contradict humanitarian principles,” he added, calling on the Government to act on the assurances it made in the past and lift restrictions. Mr. Lowcock, who is also the UN Humanitarian Affairs chief, said that imports of aid and commercial food has declined recently. “Confidence among commercial shipping companies has eroded due to delays, including as a result of inspections undertaken by the Saudi-led Coalition after these vessels have been cleared by UNVIM,” he said. The UN Verification and Inspection Mechanism for Yemen – UNVIM for short – was established to facilitate commercial shipping in and out of Yemeni ports, in order to manage clearance requests and coordinate inspection of cargo at the ports of Hudaydah, Saleef and Ras Isa. Mr. Lowcock said that humanitarian agencies stand ready to increase their delivery of assistance to the people of Yemen, and called on all warring parties to cooperate more, to ease civilian suffering. 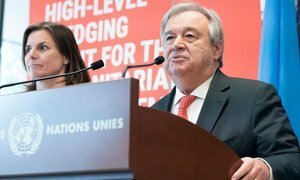 “Finally, I urge all parties to engage meaningfully with the UN, without preconditions, to achieve a lasting, negotiated settlement towards sustainable peace,” he said.